Happy New Years! I hope you had a lovely holiday season with your favorite people. We for sure did, and I’m back from the two week vacation feeling refreshed, rested, and ready for this glorious new year ahead of us. This is the second year I’ve taken off the last two weeks of the year and I plan to do this every year, including more days off throughout the year. That’s a goal for sure! More fun, playing, and time to relax so that when I do work I am at my best, which ultimately is good for us all. How appropriate to start of the first post of the year with a healthy, filling, and very tasty granola AND my monthly TV live recipe demo on ABC’s KATU AM Northwest! It seemed fitting to begin the first week of the year on TV and a recipe that can carry us into this year with good intentions for our health. And honestly the best way to start that is breakfast. You know I drink green smoothies for breakfast most everyday, but I also eat some sort of a grain with that to keep me satiated and give me the energy I need for the morning. I either eat a handful of granola or a grainy piece of toast plain. But on the days I don’t make a green smoothie, and that does happen from time to time, I make a bowl of yogurt with granola or a bowl of granola cereal. Dairy does the trick for me, keeping me full as well as the grains. And I have read in many articles over the years that the protein in dairy helps maintain weight, and that’s a good bonus right?!! 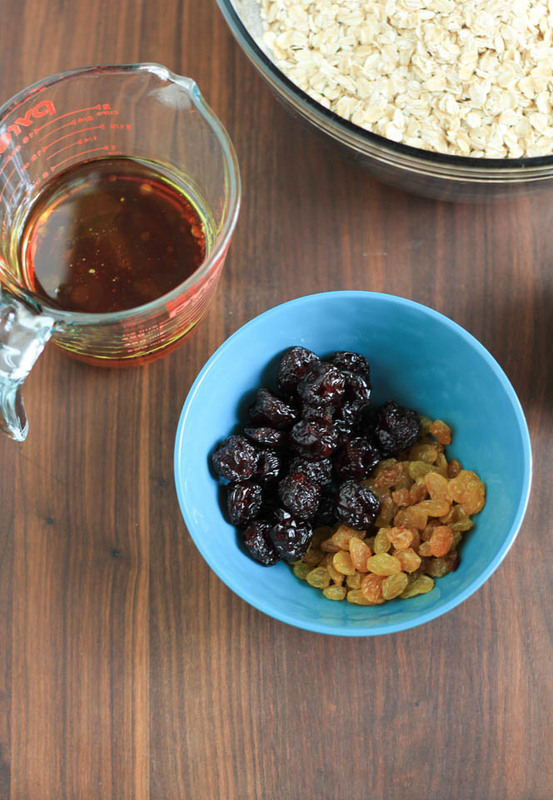 Here is my best foot forward for healthy breakfast, snacking, and sharing. I’m also doing pushups and sit ups, so here I go! I’ve made granola for years with the same-ish recipe, adjusting what I add. So you can totally change up the add ins if you prefer other nuts and or fruits. But these dried cherries were calling my name, they were at my local grocery store and they are dried Bing cherries from the Pacific Northwest. And it seemed fitting to pair that with Oregon Hazelnuts, toasted and chopped up. 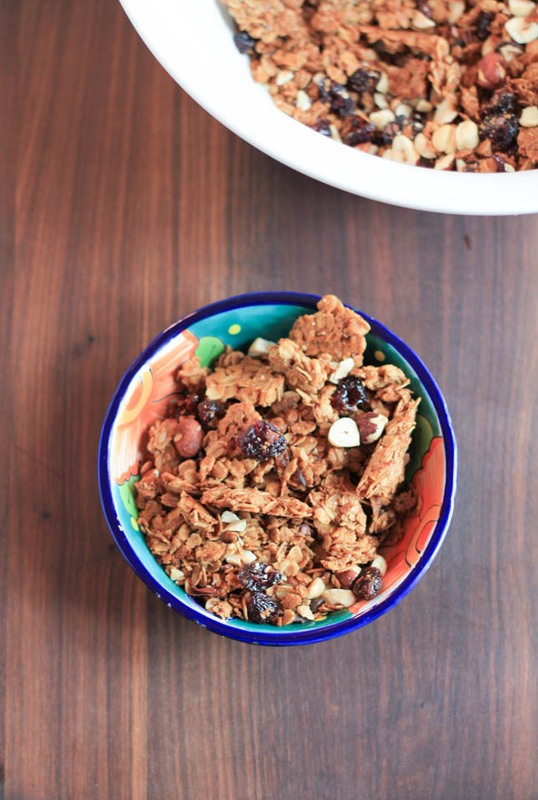 Here’s to a happy and healthy new year and a fitting PNW Dried Cherry Hazelnut Granola recipe! Toasted Nuts: Place almonds on a baking sheet, place in oven at 350 degrees for about 8-10 minutes or golden brown. Remove and allow to cool. Toasted Coconut: Place coconut flakes on baking sheet, place in oven at 350 degrees for about 8-10 minutes or golden brown. Remove and allow to cool. 1. In a large bowl add oats, cinnamon, and salt, stir to combine well using a spatula. In a medium bowl add olive oil, honey, and vanilla. Whisk to combine using a fork. Add the liquid to the oats mixture, using a spatula, mix well. 2. 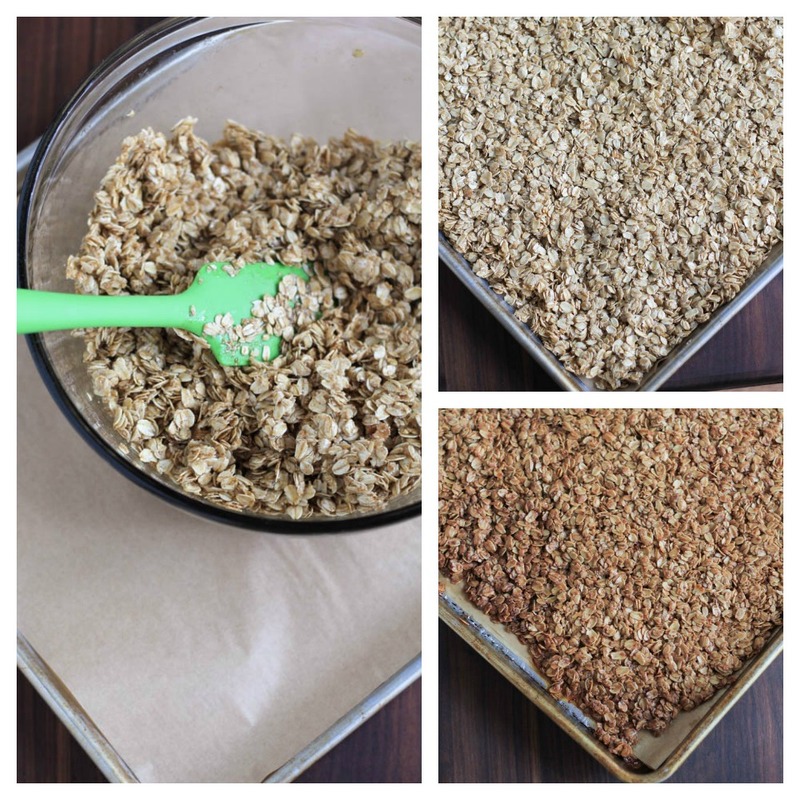 Place oat mixture on a parchment lined baking sheet. Spread evenly, pressing down lightly to compact the mixture. This creates larger chunks after baking. Place in oven and bake for 25-30 minutes, or until golden brown. 3. While the granola is baking add the toasted hazelnuts, dried cherries, toasted coconut, and cacao nibs to a large bowl, mix to combine. 4. Remove baked granola from the oven, allow to cool for 20 minutes. 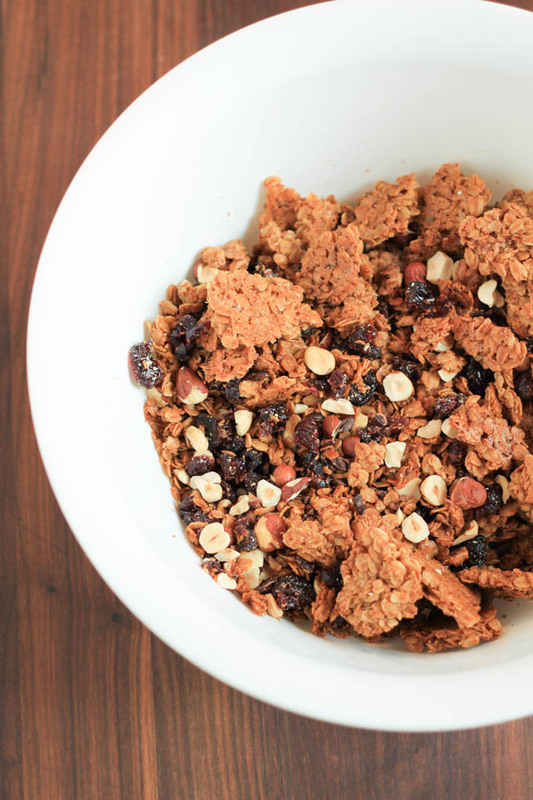 Once cooled, place the granola in the large bowl with the nut fruit mixture. Break apart the granola into medium chunks, easy for snacking. Serve with yogurt and fresh fruit, or milk for a hearty and healthy breakfast. Or pack up in a small bag and take with you on your next hike for a filling snack! Homemade granola is the best, isn’t it? I’ve never tried adding nibs to the mix. I’ll have to give that a go next time! Congrats on your TV feature! And this granola looks sooo good! How did you get it to clump together so nicely? whenever I make granola it never really sticks together into large clusters! Thank you! I am on every month, so it’s been so much fun! It’s a part of the directions- you press the granola down into the pan right before baking!! Delicious ingredients (I love cherries and hazelnuts!) This would be a lovely breakfast or snack to take on a trip or hike! Looks so yummy! I love a good granola!